Last year, Louisiana Gov. Bobby Jindal (R) — a rising star in the GOP and potential nominee for the presidency in 2012 — gave a widely mocked rebuttal to President Obama’s State of the Union address, prompting many pundits to conclude that his national political career was over before it began. But, taking a cue from Rudy Giuliani’s exploitation of the 9/11 attacks while mayor of New York City, Jindal saw a chance rebuild his political capital by using the Gulf oil spill. He sprang into action with press conferences and helicopter rides to show he’s a take-charge leader. The governor quickly became Obama and the federal government’s chief critic, relentlessly attacking their allegedly slow response to the spill and lambasting the “red tape and bureaucracy” preventing him from getting the job done. Jindal’s theatrical deployment of these trappings of leadership has been largely rewarded by favorable press coverage, reigniting speculation of a 2012 run. But new revelations and a close inspection of the facts suggest that Jindal’s sound and fury is little more than political grandstanding for the Fox News set, and it serves to obscure Jindal’s own serious failings in the spill response effort. While Jindal has been relentless in attacking the federal government for dragging its feet, he has delayed the deployment of National Guard troops, led a crusade to build artificial sand berms that most experts say won’t work, and confused the planning of the spill response. Moreover, experts said his “antagonism could actually slow down that response.” “When that stuff happens, you actually take away the ability of the unified command to get their job done,” said former Coast Guard official Doug Lentsch, who was involved in the Exxon Valdez disaster and helped develop the Oil Pollution Act of 1990. But the true impact of Jindal’s blustery leadership may never be known, as Jindal vetoed a bill Friday that would have required him to make public all of his office’s documents relating to the spill. “His excuse is he is afraid that BP would find out something Louisiana did, and I always thought justice was about the truth and facts,” said Republican state Sen. Robert Adley. NATIONAL GUARD: Nowhere has Jindal’s hypocritical grandstanding been more apparent than on the issue of National Guard troops. 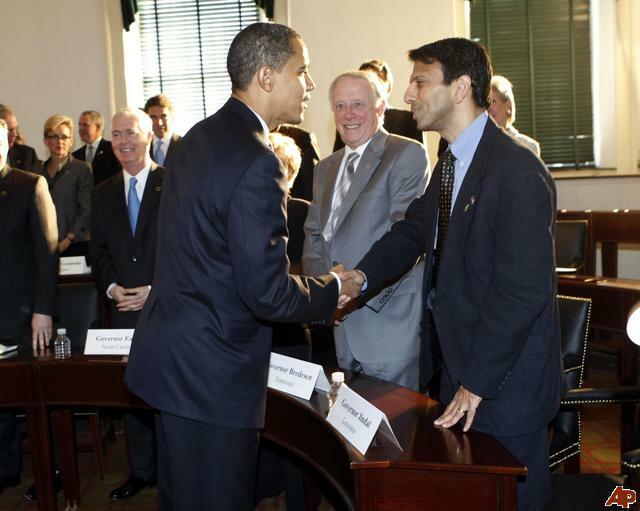 Jindal demanded 6,000 Guard troops in the early days of the spill — a request the Department of Defense quickly approved. “We are absolutely in a war to protect our way of life,” Jindal has said. Despite his constant attacks on the federal government for supposedly under-resourcing his efforts, almost two months after the troop request was approved, “only a fraction — 1,053 — have actually been deployed by Jindal to fight the spill,” a CBS News investigation found. This prompted Obama, in his Oval Office address, to specifically and publicly urge Jindal and other Gulf state governors “to activate these troops as soon as possible.” In response to the CBS investigation, Jindal predictably blamed the federal government for the delay, saying, “the Coast Guard and BP had to authorize individual tasks.” But Coast Guard Adm. Thad Allen, the national incident commander, flatly denied this claim. “There is nothing standing in the governor’s way from utilizing more National Guard troops,” Allen said. “In fact, the Coast Guard says every request to use the National Guard has been approved, usually within a day,” CBS noted. Finally, Jindal’s office admitted that the governor “has not specifically asked for more Guard troops to be deployed,” but failed to explain why Jindal had not used the troops. As Washington Monthly’s Steve Benen noted, “Jindal is either deeply confused about something he should understand, or he was lying.” Jindal’s failure here underscores the need to bring in the military to take charge of the disaster response, as the Center for American Progress has urged. PLANNING: Another favorite line of attack of Jindal’s is to insist that the government did not properly plan for the disaster. “We kept being assured over and over that they had a plan, that there was a detailed plan, that it was coming; we never got that plan,” he said. But as the New York Times noted, “under the law, oil spill experts said, there are only two kinds of government plans pertaining to spills, and the state is partly responsible for both.” Response officials confirmed that Jindal’s own office approved plans that are currently in use, despite his feigned ignorance. More troubling, some of the plans prepared by the state “are rife with omissions, including pages of blank charts that are supposed to detail available supplies of equipment like oil-skimming vessels.” For example, “a draft action plan for a worst case is among many requirements in the southeast Louisiana proposal listed as ‘to be developed. '” When pressed at news conference as to why the state had not developed better plans, Jindal once again reverted to attacking the federal government. As the Baton Rouge Business Report observed after the exchange, “The impression left that afternoon on several members of the media was that the state hadn’t done any oil-spill planning before [the Deepwater Horizon explosion], instead choosing to rely on other entities for protection.” Moreover, Jindal keeps moving the goal posts of the plan, such as when he “requested three times as much boom as the state’s plan had called for — and 50% more boom than existed in the entire nation.” Soon thereafter, he switched gears to the sand berm approach, which is barely mentioned in the state’s plans. But it’s not surprising that Louisiana’s planning has been lacking, considering that Jindal undercut the state’s ability to prepare for an oil spill. He cut $750,000 from the budget of the oil spill research and development program and moved the Louisiana Oil Spill Coordinator’s office from the governor’s direct oversight into “a basement in Facility Planning” at the Louisiana Department of Public Safety and Corrections.